Ugo Torre first appears in the Painesville, Ohio, area in 1928. 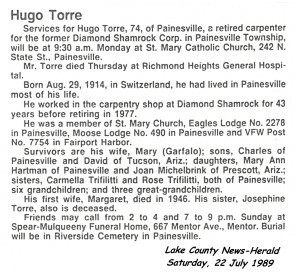 In America, Ugo Torre was known as Hugo Torre. Ugo Torre, son of Nunzio Torre and Giuseppa Puglisi, was born on Saturday August 29, 1914 at Wangen, Switzerland. Hugo’s father was a migrant worker building a tunnel in Switzerland when Hugo was born. Ugo lived at the family home in Novara, Sicily, from age two until he immigrated to the United States in 1928. 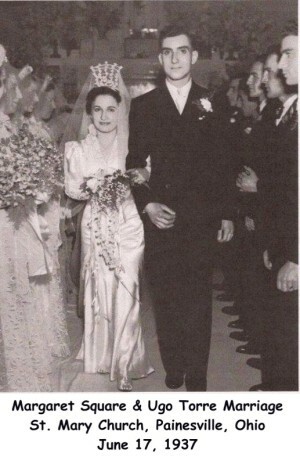 Ugo married first, Margaret Square, daughter of Giovanni Scacciavillani and Anna Antonia Cardegna, on June 17, 1937 at Saint Mary Catholic Church at Painesville, Lake County, Ohio. 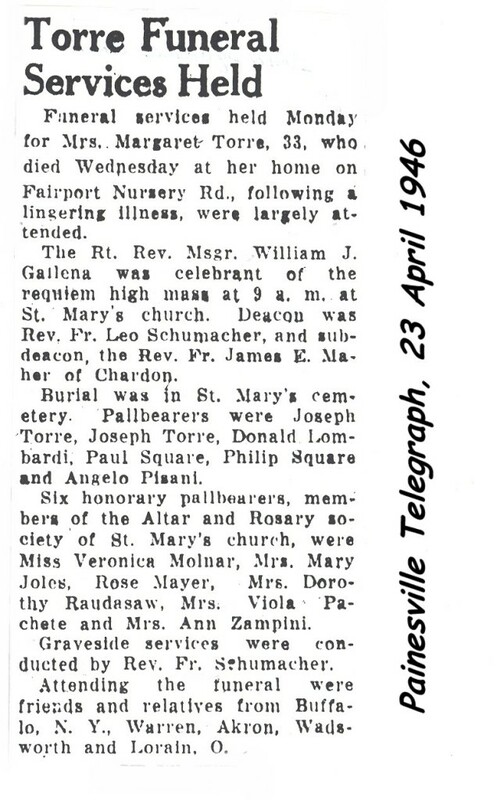 After the death of his first wife, Ugo married second, Mary V. Garfalo, daughter of John Garfalo and Grace Motzell, on September 24, 1949 at Lake County, Ohio. Ugo died on July 20, 1989 at Richmond Heights Hospital at Richmond Heights, Cuyahoga County, Ohio, at age 74 of cardiopulmonary arrest. His body was interred at Riverside Cemetery at Painesville, Lake County, Ohio. 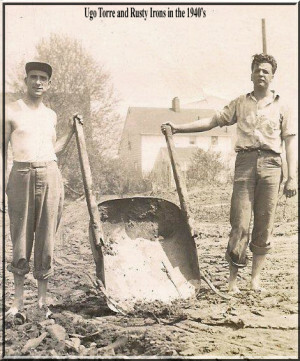 Ugo Torre, age 13, and his father, Nunzio Torre, immigrated to the United States on July 12, 1928, travelling to Painesville, Lake County, Ohio. 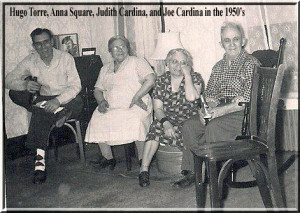 Ugo’s sister, Antonia Giuseppa Torre also lived in Painesville; she immigrated in 1921. Ugo’s sister, Carmela and mother immigrated in December 1928. 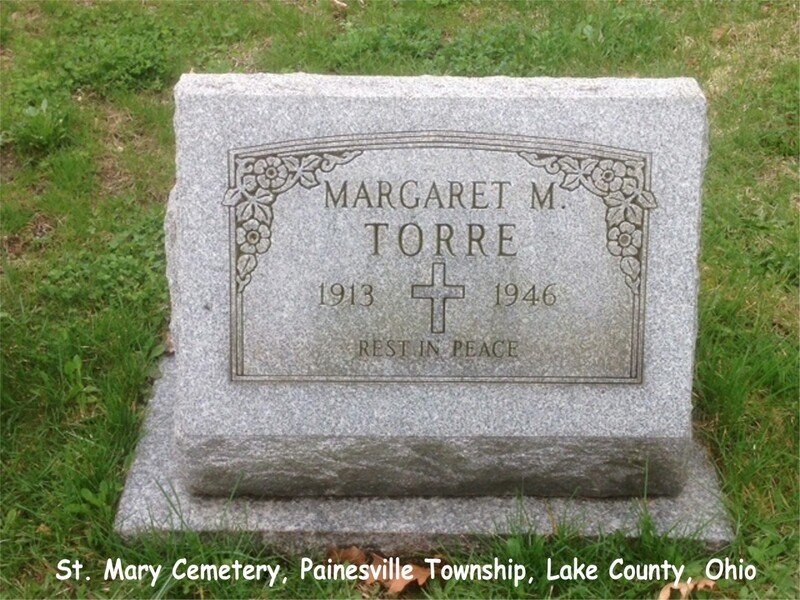 Ugo’s sister, Rosa Torre migrated to Painesville in 1955. 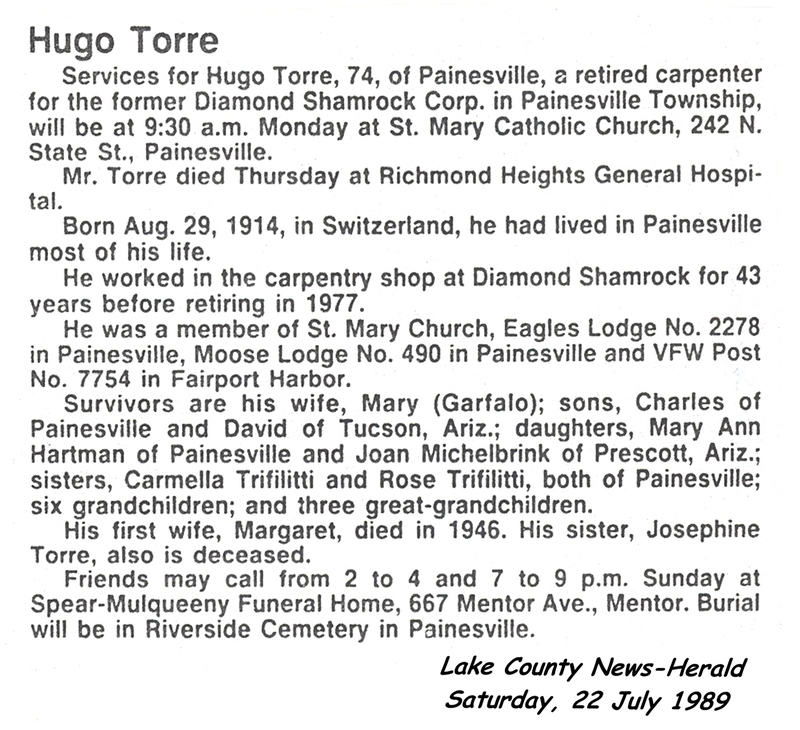 Hugo was employed as a carpenter by the Diamond Alkali Company for 43 years, retiring in 1977. 1. Joan Torre was born on October 8, 1939. She married Gerald A. Michelbrink, son of Dell Michelbrink and Elsie Cherne, on May 10, 1958, at Painesville, Lake County, Ohio. 2. Mary Ann Torre was born on January 7, 1942. She married Douglas Hartman on November 17, 1962, at Painesville, Lake County, Ohio. 3. David Torre was born July 14, 1953, at Painesville, Lake County, Ohio. 4. Charles Hugo Torre was born July 14, 1959, at Painesville, Lake County, Ohio. He married Donna Kochis, daughter of Bart J. Kochis and Lillian Gleske.